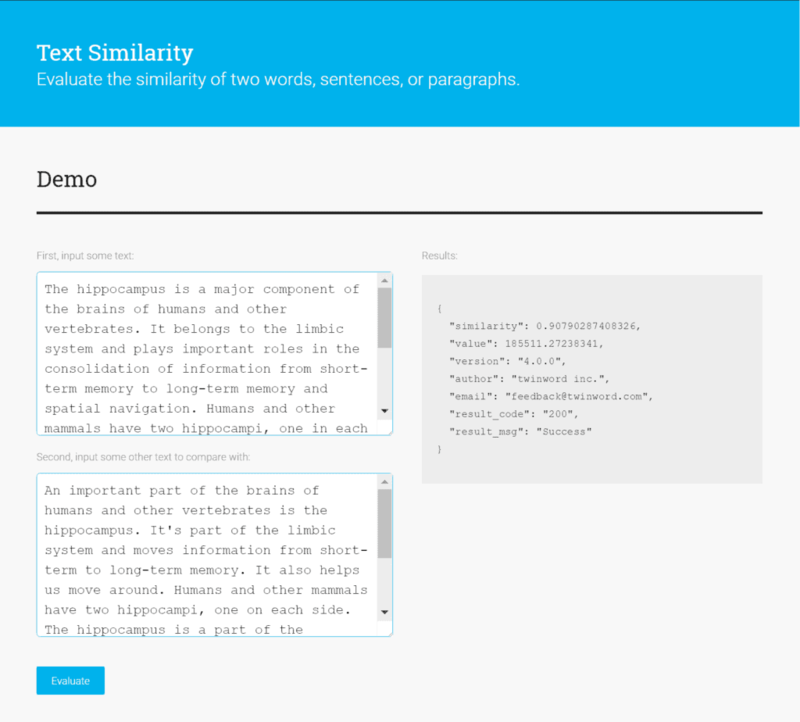 Twinword provides some powerful text-analysis APIs. 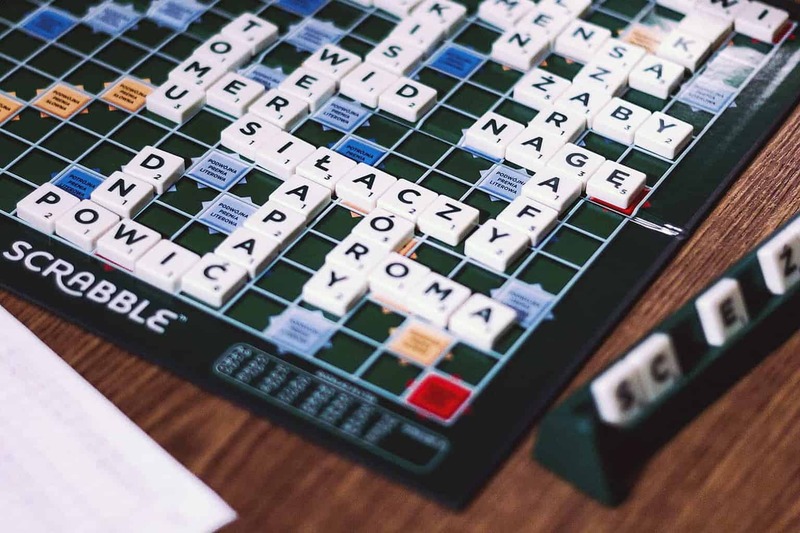 These natural language processing (NLP) APIs work simply out-of-the-box. This is what makes us unique. You won’t have to deal with training data. If you simply want to know the relationship score between two documents, just make an API call and you got it. Best of all, it is provided as a REST API with the results in JSON format that can be easily parsed. Essentially there are two ways to consume our APIs: through an API Marketplace or directly through us. Regardless of which way works best for you, the API results will be exactly the same. Here is a table breaking down the two methods. Twinword APIs are listed on two marketplaces, Mashape and RapidAPI. However, since the merger of these two platforms, you can use either account to log into both platforms. The benefit of using these platforms is the ability to leverage their ecosystems. They have many different APIs from different providers all listed. The good thing is that both platforms have very similar methods of getting started. Visit either Mashape or RapidAPI and find the API you are interested in. Sign up for an account and create an “App” or “Project”. 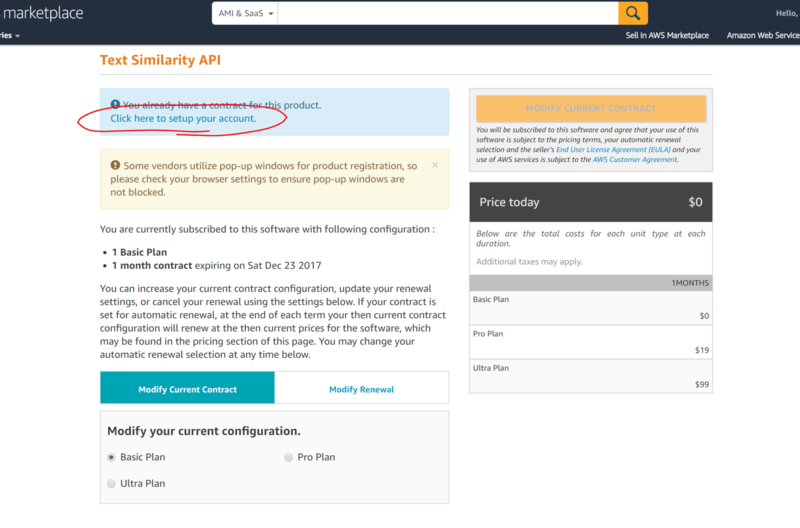 Select an API and click the “pricing” tab to select a plan (free plan available). Follow the sample code and install any necessary SDKs. You can also visit the getting started guide for more details. It is the same guide for both platforms. If you would like to keep things simple and just consume our APIs directly with us, you can do so. Also, if you already have an Amazon AWS account and would like your API subscription charges to be billed to your AWS account, this method is for you. Visit our main API page and see our full list of APIs. Once you’ve selected an API, under the “Consume API” section of the API’s web demo page, click the “Subscribe on AWS Marketplace” button. 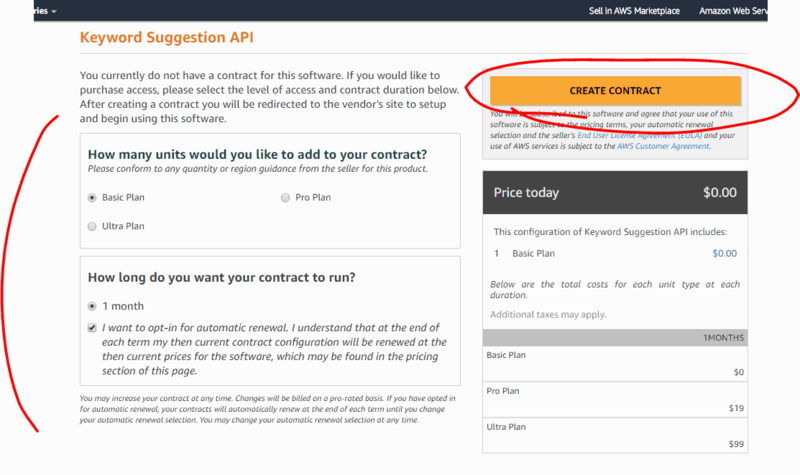 Once on the AWS Marketplace showing the API you selected, click the “Continue” button. If prompted to, login to your AWS account. Then select one of the plans and click the “Create Contract” button. 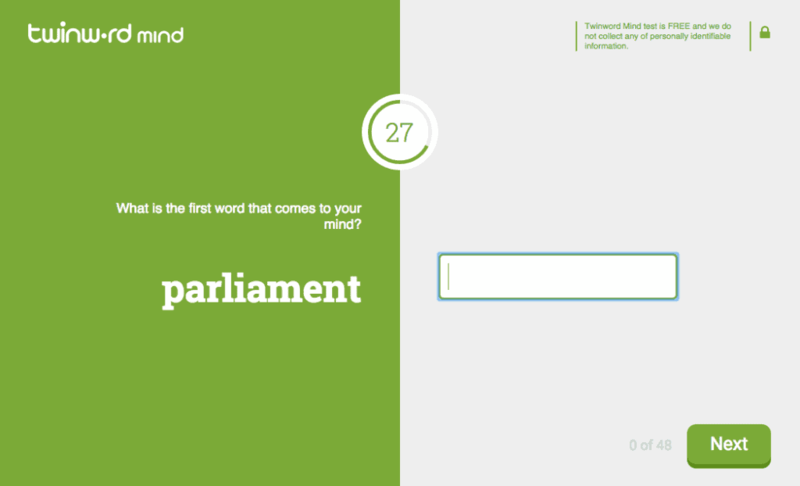 After clicking the link, you’ll be taken back to the Twinword API My Account login page. Simply login with your AWS account. After logging in, you should now see the API you subscribed to in your “Subscribed APIs” list. When you make requests to the API, please include your API key in the header as instructed in your account page. You can also track your API usage on this same page. Please note to use the API Endpoint listed in the “Subscribed APIs” list here and NOT the endpoints listed in any documentation (they are different). If you would like to see the capabilities of our APIs, you can simply visit any of their web demo pages. 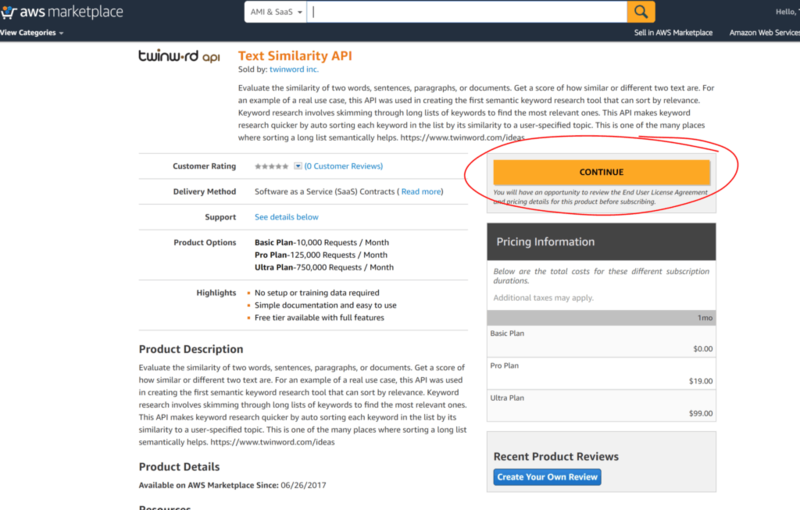 If you are looking for the API documentation, you can find the “See Documentation” button in the “Consume API” section of each API’s web demo pages. Our documentation is hosted on Mashape and are mostly the same for each method. The only differences are the code examples and the API endpoints. If you are going through the marketplaces, you’ll use the endpoint URLs listed in their code examples. 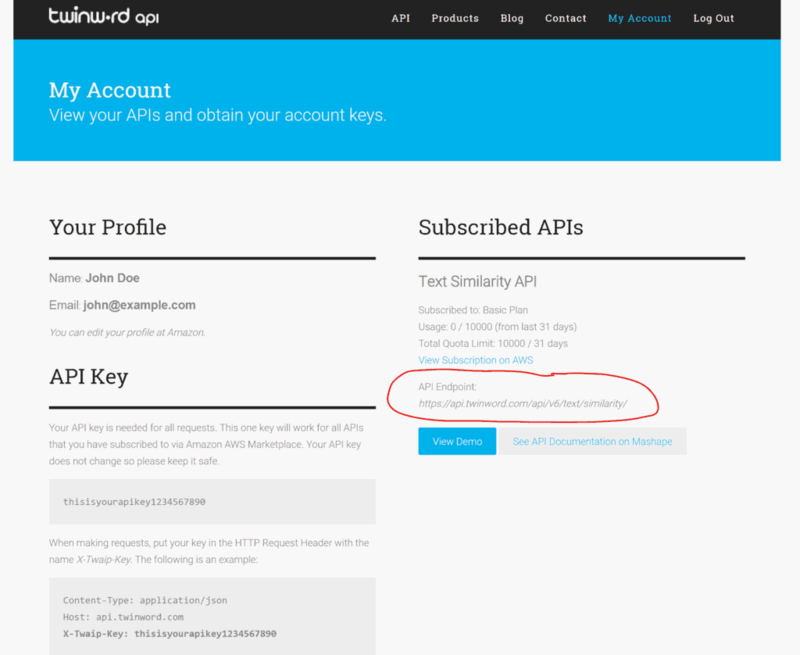 If you are connecting directly, check your Twinword API My Account page for the URL endpoints of the API listed in your “Subscribed APIs” list. If you are going through the marketplaces, you’ll need to create an “App” or “Project” to generate an API key for it. After creating it, your unique API keys will be automatically included in the code examples. 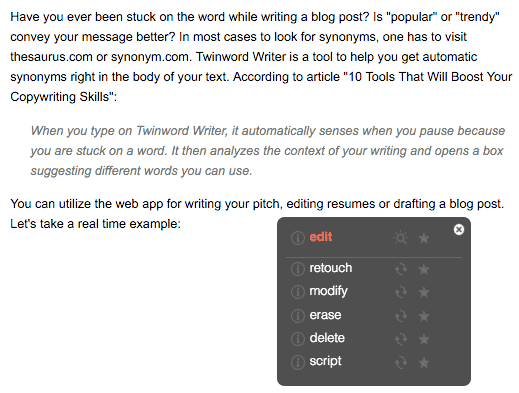 If you are connecting directly, check your Twinword API My Account page for your unique API key and how to include it in your requests. This one API key will authenticate you for all APIs that you subscribed to and consume directly with us. Check out our full API list and get started using the power of NLP right out of the box. If you have any questions, feel free to contact us or leave a comment below. If you can’t find your Twinword API subscription on your “Subscribed APIs” list, your browser’s pop-up blocker might be the issue. Enable pop-ups in your browser by clicking “always allow pop-ups and redirects from https://aws.amazon.com”. Afterwards, click again on “Click here to setup your account” for the pop-up to open automatically. 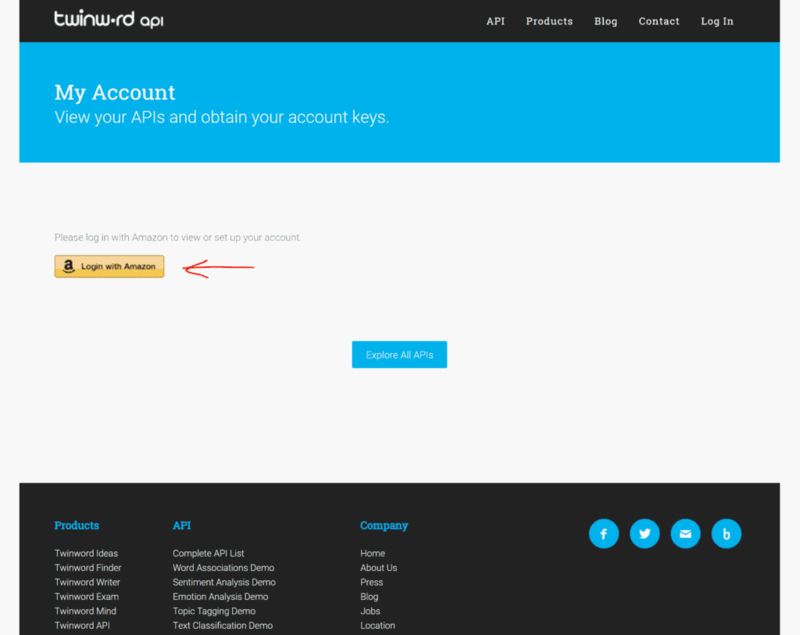 If you follow the link manually, the API subscription will not show up on your Twinword API page. Therefore, please make sure that you enabled pop-ups before setting up your account. Check out the video below where we show you how to do it correctly.